The beauty of Santorini is immense: from the northern tip and beautiful Oia, down to Akrotiri and the Red Beach, the entire island offers magnificent views of the volcano and the caldera. Watching the sunset from a point on the western coast is a must and the applause from tourists who greets the final sinking of the orange sun highlights its beauty. If you like walking, a nice route is from Fira to Imerovigli and then Oia, along the caldera. The entire route is long (about 10 km) but offers nice view to the Aegean Sea and the volcano. Santorini is a marvelous island that gets very popular in July and August, so if you like calm vacations go from April to June or from September to October. Do not miss the boat trip to the volcano and the sunset in Oia (or at least another caldera village, like Fira and Imerovigli). The beaches are not the highlight of Santorini, but nice if you want to enjoy a swim. Most popular beaches are the Red beach, Kamari and Perissa. Also visit the Minoan town of Akrotiri, which reopened in April 2012 after seven years of reconstruction. The main port of Santorini is Athinios, located 10 km from Fira, the capital of Santorini. This is where ferries arrive and depart from Santorini. There is a taxi rank at the port and public buses every time a ferry arrives, even at night. The other port of Santorini, the old port in Fira, is used only for cruise ships to dock and for tour boats, not for ferries. All ferries arrive and depart from Athinios. The airport of Santorini is located in Monolithos, close to the beach resorts of the island. There are taxis outside the airport. Be prepared for an expensive visit. 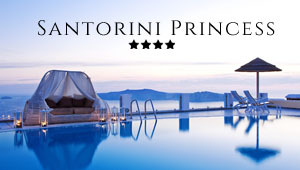 Santorini is a tourist island and most services, from food to taxis, are bit expensive. Roads are very good in Santorini, although they are narrow (one line per direction). Cars are not allowed to enter the caldera villages (Fira, Oia, etc), so you have to park outside the village and then walk. Be careful if you are driving scooter/ motorbike because accidents are pretty frequent. There are frequent buses that work from early in the morning till midnight in Santorini. The central bus station is located in Fira and from there you take the bus to north (Oia and other villages) or south (Kamari, Perissa, Akrotiri).